For many years, truth be known, cardiologists have just believed that getting a heart attack was bad luck, blaming it on a bad family history, a poor diet, being overweight, or saying "I guess it was just your time, because you haven't been doing anything wrong." For the past century, scientific articles have continued to pour in showing that there are very many risk factors for heart disease, like elevated cholesterol, high blood pressure, diabetes, and so on. There is no question that such risk factors are clearly associated with heart disease, and, when uncontrolled, appear to accelerate its development. But, there IS a missing link that we must discuss right now. In recent years, cardiology now appears to have collectively realized and accepted that coronary atherosclerosis (arterial narrowing and blockages) never develop in the absence of inflammation in the coronary arterial wall, initially in the endothelium, its innermost layer. As doctors despise treating anything they feel they do not understand, this revelation has helped many of my cardiologist colleagues to feel comfortable that they are no longer treating just 'unlucky' individuals, and that they are no longer limited to just taking care of their patients after the heart attack has already occurred. Instead, the thought process is akin to: "Your coronary arteries are chronically inflamed, and we need to minimize that inflammation as best we can." Yet, while the focus has now shifted to coronary artery inflammation, the conclusion is still that a heart attack victim is more unfortunate than anything else, but that there is now a name for that 'misfortune': inflammation. Nobody, it seems, is yet ready to ask why the elephant named inflammation is in the room to begin with. 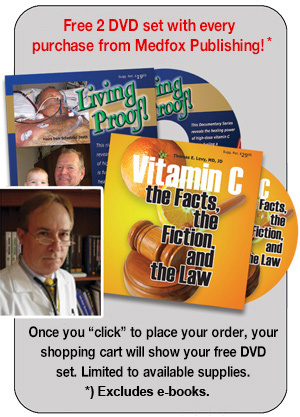 Most people, including healthcare practitioners, think of scurvy only as a severe vitamin C deficiency throughout the body that rarely occurs any longer in the modern world. And this is correct. However, scurvy also occurs when vitamin C is severely depleted in one tissue or organ while the rest of the body has ample amounts. This is known as focal scurvy – which often exists in individuals who appear to be otherwise completely healthy. And where there is focal scurvy, there is focal inflammation, as discussed below. Inflammation cannot exist where there is no vitamin C deficiency. Pathophysiologically, inflammation and vitamin C deficiency are the same. Focal inflammation is a synonym for focal scurvy. All chronic diseases are states of focal scurvy in the affected tissues and organs. So, in the case of coronary atherosclerosis – we must ask an important question. Why is there always inflammation and a state of focal scurvy in the coronary arterial walls? The only common way for the coronary artery to become severely deficient in vitamin C is to have pathogenic microorganisms take root there and metabolically consume (oxidize) all, or nearly all, of the vitamin C normally present. When this is occurring chronically, the result is chronic inflammation. If there is a short-lived infection elsewhere in the body and only transiently releasing pathogens into the bloodstream, inflammation can come and go, and vitamin C levels can be restored. But when the pathogen supply in the blood is continuous, the inflammation remains and even vigorous vitamin C supplementation will typically not resolve that inflammation. That inflammation then becomes the disease, as the macrophages and other immune system agents enter the inflamed area of the coronary artery and try to chronically "cure" the incessant seeding of pathogens. The increased oxidative stress due to the release of reactive oxygen species from the white blood cells resulting from the chronic inflammation in the absence of the vitamin C is the initiator and primary propagator of the atherosclerotic process. For some years now, the cardiology and dental literature has shown that chronic periodontal disease (infected gums) is clearly "associated" with increased coronary artery disease. While this is true, it is finally becoming clear that this "association" is really cause-and-effect. That is to say, the oral pathogens directly cause the atherosclerosis. Multiple studies now reveal that the blood vessel walls and the atherosclerotic plaques contain the same array of pathogens that are found in the infected gums. In addition, a much higher concentration of these pathogens has been found to be present in the blood clots that acutely and completely block off the coronary artery and cause the heart attack. Yet the literature continues to assert only an "association" between these pathogens and coronary artery pathology. Sometimes simple logic just gets tossed out the window. How could a heart attack-causing blood clot accumulate a high concentration of organisms from blood that is supposed to be completely sterile when cultured? Of course, no researcher is going to resolve gum disease, document the disappearance of coronary inflammation, and then re-infect the gums to show the return of the inflammation. Without the use of clear-headed logic, the oral pathogen-coronary inflammation connection remains forever a mere "link or association," and clinicians need not feel compelled to make oral examination and treatment a mandatory part of the treatment of any patient with suspected or documented coronary heart disease. The chronic infection of root canal-treated teeth is the source of the coronary inflammation for most heart attack patients, probably 70% of the time or so. Chronic gum disease probably accounts for another 20 to 25% of cases. The remainder comes from other unidentified sources chronically seeding pathogens into the blood, like infected tonsils or perhaps even a chronically constipated and pathogen-proliferating gut. The point is that all coronary heart disease patients are not being correctly and completely treated if their mouths have not even been examined or considered in the evaluation and treatment of their condition. In point of fact, such patients are having the most important reasons for their heart disease being ignored or otherwise neglected. Oral pathogens are the reason for well over 90% of heart attacks, and probably less than 5% of cardiologists and other physicians even know to look for this causative factor. A heart attack patient is NOT just unlucky. Rather, the heart attack patient has an overwhelming likelihood of having a steady supply of oral pathogens and toxins coming from root canal-treated teeth and/or chronically infected gums. Bottom line, while nobody likes to get in the dental chair, avoiding the proper dental care and intervention can result in a much sicker and a much shorter life.